Few people are aware that Detroit was home to one or more amusement parks for 75 years. 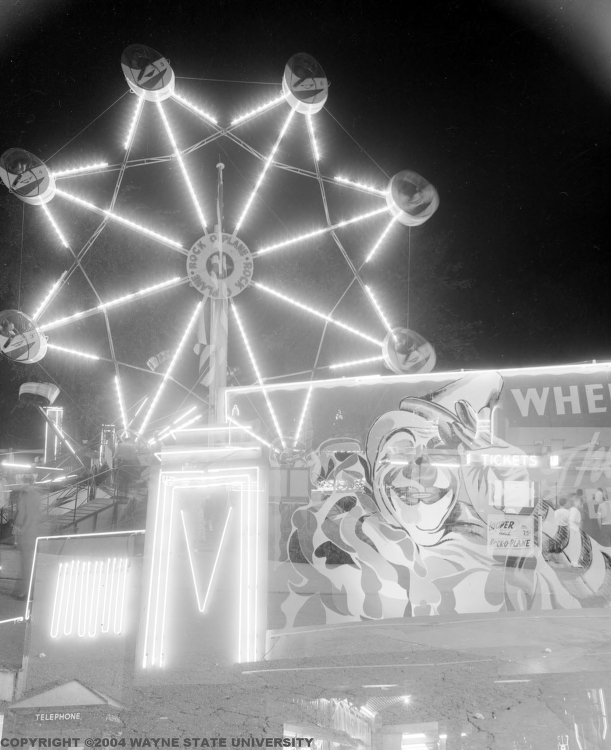 According to DefunctParks.com, many different amusement parks operated in Detroit at various points during the 20th century. The first one was Electric Park, which opened in 1906 next to the bridge to Belle Isle. In addition to attractions such as "the Great Chick", a comedian and "tramp cyclist", the acrobat Mlle. Patrice, and a scale model of the 1889 flood of Johnstown, PA, Electric Park featured dance halls, and rollercoasters with names like The Big Dipper. Continued opposition to the park as an "eyesore" resulted in it finally being demolished in 1928. Thankfully, just a year before Electric Park met its demise, Edgewater Park opened at the intersection of Seven Mile and Grand River. A major attraction well into the 1960s, Edgewater featured an enormous ferris wheel and an exceptionally raucous rollercoaster named (at various points) the "Wild Beast" and the "Soul Train". Sadly, Edgewater Park is also infamous for its contribution to the 1943 race riots in Detroit: the initial brawl on Belle Isle which tripped off the riots was reportedly triggered by two young black men looking for revenge after being either kicked out of, or attacked by white youths at, Edgewater. Other parks in the area included Eastwood Park, where Duke Ellington played in 1936, and the Ingersoll Amusement Center, which featured a rollercoaster by John A. Miller, a great in the history of amusement parks; he also built the Big Dipper at Electric Park. So, need I mention how cool an amusement park is as a location for a fight scene? Aside from that, though, how about setting a Cold War intelligence exchange at the top of a ferris wheel? Send your pulp campaign's PCs to a gala ball at Belle Isle, and give them a chance to go slumming at the Electric Park. Or perhaps you could send your time travelers back to prevent the 1943 race riots by intervening in the altercation at Edgewater Park. Just remember, everything's better with a corn dog! The Detroit News has an article about the amusement parks of Detroit, and WaterWinterWonderland.com has some great pictures, signage, and reminiscences about several of the parks: Electric Park, Edgewater Park, and Eastwood Park.